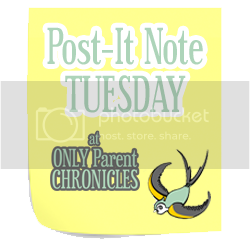 Only Parent Chronicles: Post It Note Tuesday ~ Sage Wisdom? Post It Note Tuesday ~ Sage Wisdom? I like to make bags for the kids to surprise them with...books, puzzles, snacks etc. They always look forward to those goodie bags even with them getting older. If you're going to tie them to the roof of the car best use Duct Tape. The ends of rope often flap in the wind and that ends up chipping your paint. We just returned from a road trip to my brothers. It takes two days to get there. One of the best things I did was buy two new movies the Renegades hadn't seen and I also bought new nintendo games. So when we got in the car there was something new to them. The other thing I did was take notebooks and paper. My daughter then took notes on each days activities. It kept her occupied. DVD's, Nintendo DS's and when that fails Duct Tape. OR I guess you could just make them some sort of fun travelling themed goodie bags. I linked up this week!